Leading Galway estate agent DNG Maxwell, Heaslip & Leonard is offering to the market this stunning four bedroom detached, owner occupied, residence, extending to over 2,100sq ft of comfortable living space and presented in absolutely immaculate condition. The property is located in Lackaghbeg, just off the Galway/Roscommon road (N63 ) in a quiet cul de sac, within walking distance of the local national school, Flynn’s SuperValu, and Lackagh village, from where Claregalway and Athenry school buses operate, in addition to a city work bus. The property has been owner occupied since it was constructed in the early 2000s, which is evident from the attention to detail throughout and includes many features such as a solid oak kitchen, extra high 8'8"ceiling on the ground floor, natural slate roof, large workshop to rear, master bedroom with en suite and Sliderobes. Ground floor accommodation comprises an entrance hall, large sitting room, kitchen/dining room, utility, guest toilet and office/playroom/lounge, with the first floor comprising four double bedrooms with master en suite, and a fully tiled main bathroom. Additionally a Stira stairs leads to the attic which is suitable for conversion, if desired. 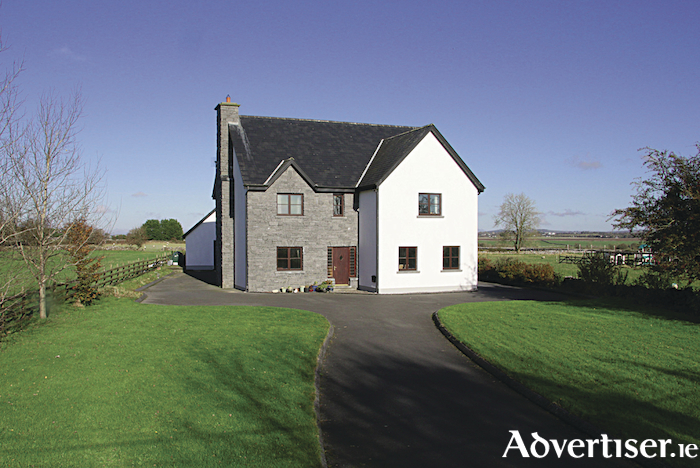 Externally, the property sits on a fully landscaped site of circa half an acre, with a private water well, tarmacadam driveway with continuous kerbing, post and rail fencing, a stone wall to the front, with the front gate suitable for electronic entrance as the underground wiring is complete. Additionally, the large workshop at the rear extends to circa 94sq m, and comes with additional attic space and full planning permission. He added: “In addition, the new motorway junction which will allow access to Dublin, Limerick, Sligo, and Galway is only 2km away, providing ease of access to all locations. Anyone looking to find their ideal family home in a lovely village community should call without delay to arrange a viewing." Viewings can be arranged by calling a member of the DNG Maxwell, Heaslip & Leonard residential sales team on 091 565261. Page generated in 0.0904 seconds.